This month marks the 60th anniversary of a remarkable pilgrimage. 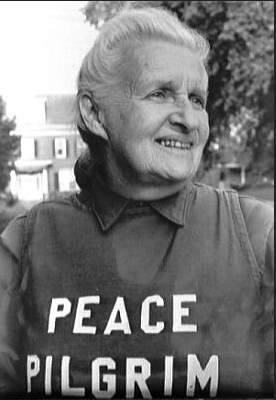 A story by NPR reports: In 1953, Mildred Norman set off from the Rose Bowl parade on New Year's Day with a goal of walking the entire country for peace. She left her given name behind and took up a new identity: Peace Pilgrim. She vowed to be a wanderer until mankind learned the way of peace and walked over 25,000 miles and fasted until she was offered food, and traveled on foot until she was given shelter. To prepare for her walk she hiked the entire length of the Appalachian Trail in one year -- the first woman to do so. Determined to walk until the world declared peace, she walked for 28 years carrying no money, with only the clothes on her back and a few items in her pockets. She died in 1981 … riding in a car. I've always thought her journey amazing. and yes -- I got your email.... I will respond :) As you can tell, less fat, more joy is waiting my return! I remember doing a post on her a while back. Truly amazing and inspirational woman.